Discussion in 'Transformers News and Rumors' started by Lucas35, Oct 6, 2018. Thumbaticon "It's all right, I'm an emergency vehicle!" Beautiful cover. I love the coloring/shading on Optimus, he looks so freaking regal. Love it. Nice nod to Marvel US issue #22. My favourite artist and colourist duo doing the best. I love aileron and arcee over on the side, cute. That’s phone wallpaper material, right there. Thank you Kei, Josh, oh and Barber for keeping the rollicking jalopy going! It definitely helps to highlight most of the important characters that appeared in Optimus Prime and Transformers: Robots in Disguise. This issue cannot come soon enough. Okay so unlike the final LL cover, departed characters still get to show up on the final cover, that\'s nice to see. G.I.Joe\'s WO Flint made the cover! Cool! Am..guys/girls, do you see Buster there? Because I dont and that worries me a lil bit. She’s sitting on DOC’s head. 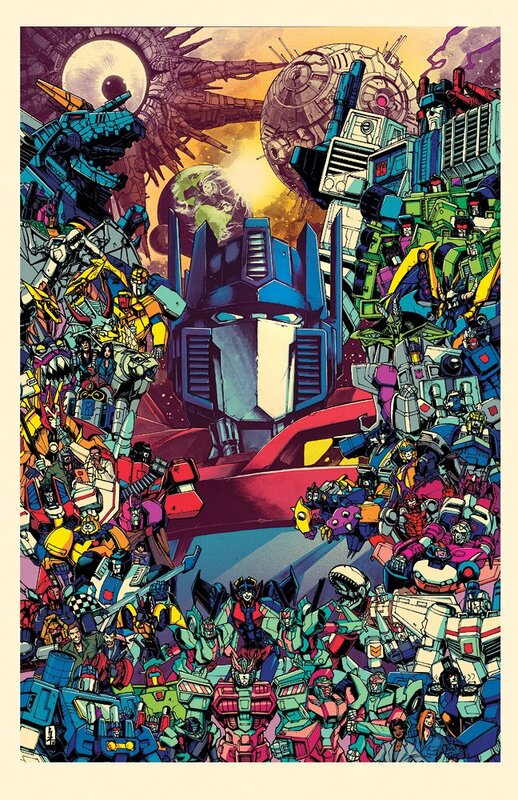 Wow just wow it’s almost strange to see everyone smiling for a change instead of looking grim all the time (except for Metroplex, and it’s kinda hard to tell for those who are wearing visors) but it’s good too good vibes. I’ll admit like some of us I was kinda expecting a cover with the Lost Loght crew too, however I’ll settle for this. Well the tankors weren’t in the story much and more TAAO characters but I am surprised by Skybite. Gonna miss this series. Not my favorite, but still a very good series nonetheless. Honestly I never quite liked it at first but as I got more interested and TAAO died it really grew on me. Now it’s probably my favourite series. Beautiful, can we have Kei Zama just draw everything ever from now on? If I was into tattoos I'd have this on my back in a heartbeat. I think it’d be amazing if she could draw the reboot which seems to be based off the siege toy line. With all the themes of grittiness and war I think her style would lend perfectly.